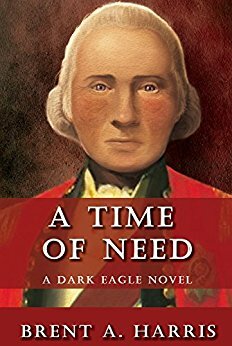 A Time of Need is available on Amazon here. Do not judge a book by the cover, they say. And they'd be darn right here - for while the cover of this book screams horror story, perhaps thriller, it's actually a romantic fantasy, filled with supernatural powers and dashing knights of derring-do. Renee is a young woman who falls in love with a Guardian knight, Kellen, and the two form a swift and deep bond with one another - until Renee signs up to a deal with a devil to become a shadow hunter, taking the deal to spare her brother from punishment. The deal forces a rift between the two lovers, and forces Renee down a dark path. There's a lot in this novella to like - I presume it falls into the novella range rather than full novel, but it packs a lot of story into it. In fact, that's a bit of a downfall, in that while the start is very nicely done, we kind of rush through much of the rest of the story, when we could do with taking a little longer and dallying with our heroes as they wrestle with tough decisions. That said, this seems really a sample of stories set in a much wider canvas, as both Renee's story and her brother's are explored in further series, so if you love what you read here, you'll find more of it and in more depth elsewhere. It leans more toward the romance side than my usual fare, but that said, I still liked it. 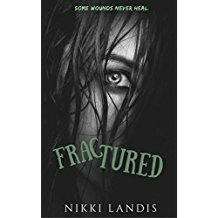 Fractured is available on Amazon here. So begins the story that really most caught my attention in this, the latest in the Anthology Askew collection. The theme this time around is Askew Communications - and the collection is filled with messages gone awry, diaries and letters telling their tales, and so on. This leads to an array of genres on show, from romance to horror, sci-fi to literary. It's that opening line above that really made me sit up and pay attention most, though, and the story that goes with it, from Rayona Lovely Wilson, is worth noting every word. It's a story of a young woman in a bad situation, with parents hooked on crack cocaine and feeling awkward and out of place in her school and the social structures within it. It feels like there's more to come at the end, but it's the kind of story that opens your eyes to the experiences of others. Elsewhere, there's also smashing tales from P.A.O'Neil, whose tale Sara Hemming, Psychic Redecorator, is full of warmth and charm even as it deals with the supernatural and unknown; Karl Taylor and his space horror New Houston, with a Martian expedition facing a gruesome terror; and Josh James' Last Will and Testament, which might make one think twice or three times before approaching that pretty soul in a bar. As ever with an anthology, some stories resonate more than others, and some of the tales here were quite slight in their substance, but the hits make it well worth the read. 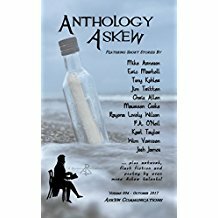 Anthology Askew: Askew Communications is available on Amazon here. This is the second in the Dai and Julia series from the authors - the first of which I reviewed not so long ago - and the first book was such a good set-up that I was itching to see what the new detective partners would get up to. You see, the two have been matched up in a modern Britain where the Roman Empire never faded, and so the mystery is against a backdrop of a very changed world. I'm not generally a big mystery fan, but that really changed the game. Sadly for me, I don't get my wish just yet to see what happens with this new partnership, as this book takes a look at the background of each individually - the stories are smashing, with Briton Dai forced into the most dangerous of games, and Roman Julia uncovering corruption and making alliances destined to last into further books. 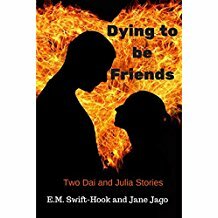 Dying to be Friends is available on Amazon here.